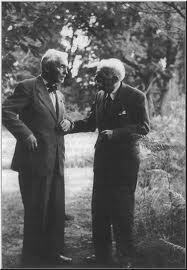 Florent Schmitt in later life (l.), pictured with fellow composer Jean Roger-Ducasse (1873-1954) (r.). Musicologists have noted the large number of pieces composed by Florent Schmitt during his life – some 138 “official” opus numbers plus a number of others. And the works span the full range of musical expression, except for opera. Of course, considering Schmitt’s seven decades as a productive composer – he continued writing music until nearly the end of his life at age 87 – perhaps the volume isn’t so surprising after all. The last major work completed by Schmitt was his Symphony No. 2, Op. 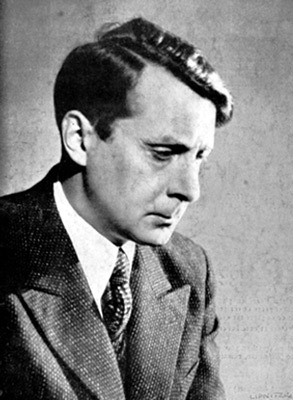 137, which was composed in 1957 and had its premiere performance at the Strasbourg Festival in June 1958 in a concert conducted by Schmitt’s fellow Alsatian-Lorrainer musician, Charles Munch. Charles Munch, music director of the Boston Symphony Orchestra, conducted the first performance of Florent Schmitt’s Symphony No. 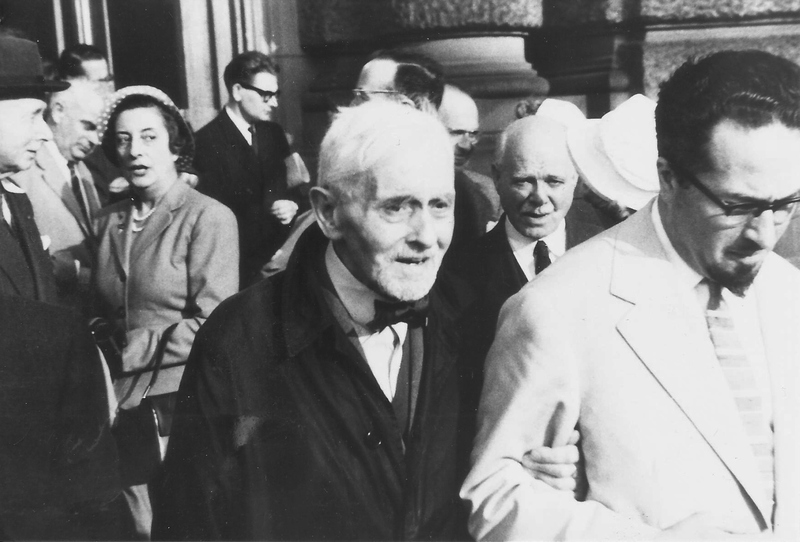 2 in Strasbourg, France in June 1958, just a few months before the composer’s death. The composer was in attendance at the concert, and received a standing ovation from the audience as well as the performers. “During the rehearsal we saw [Florent Schmitt] leave his seat several times and walk up to the front tier of the orchestra stalls to give a precise and minute direction. Charles Munch, careful and delicate, the orchestra — the wonderful Orchestre Natonal — fired with the wish of ensuring the triumph of the new work, the mute but unanimous feelings of some intimate friends seated in the Champs-Elysees Theatre — all that was even more moving, perhaps, than the enthusiasm at Strasbourg would be. Although it has never achieved widespread fame, the Second Symphony is a highly interesting piece of music. I see it being an intriguing synthesis of the various musical styles that marked the composer’s output from his earliest years forward. The Symphony is quite “contemporary” sounding, yet is rooted in tonality and retains from the past a characteristically rich and “French” orchestral color. The outer two movements treat us to the colorful, even luxuriant orchestration for which Schmitt was so well known, along with his jaunty rhythms and the sometimes-acerbic “pronouncements” from brass and woodwinds. The world premiere of Florent Schmitt’s Symphony No. 2, performed at the Strasbourg Festival in 1958, was recorded and appeared in this short-lived CD issue released in 1991 (Euromuses EURM 2009). 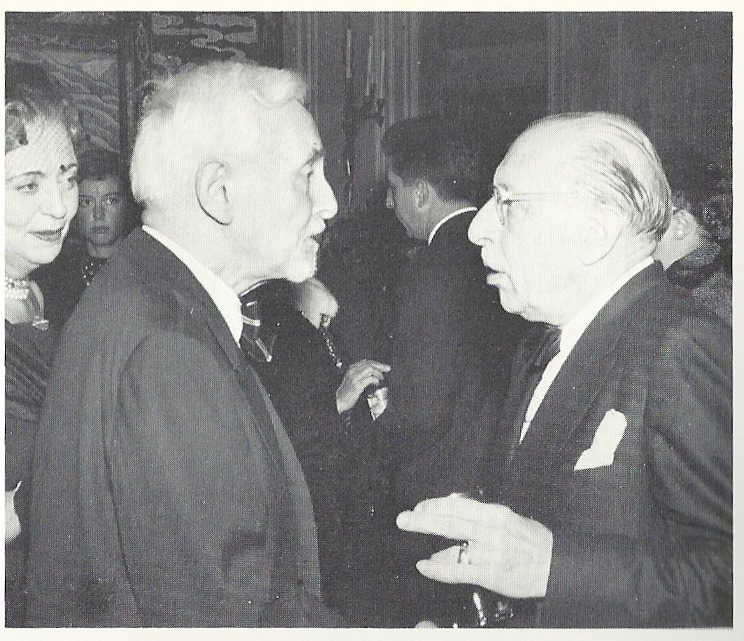 Composer Florent Schmitt (age 87) with Igor Stravinsky (age 75) and Vera de Bosset Sudeikin Stravinsky at a social gathering at the American Embassy in Paris in 1957, the year that Schmitt composed his Second Symphony. But for me personally, the second movement is the emotional high-point of the Symphony. This slow movement packs in more emotion than anywhere else in the composition. It is actually the least “modern” of the three movements – instead reminiscent of Schmitt’s Fête de la lumière from 1937 and the middle section of Schmitt’s celebrated Psaume XLVII, composed more than 50 years before the Symphony (1904). 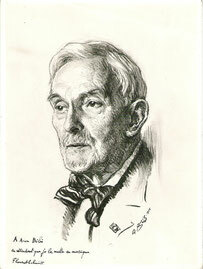 A 1956 charcoal drawing of Florent Schmitt by the artist André Aaron Bilis, created at about the same time the composer was beginning the first sketches for his Second Symphony. The Symphony No. 2 may not have the ecstatic soprano solo of the middle section of the Psalm invoking the Song of Solomon, but all of the same sensuous passion – bordering on delirium – is there. It’s a phenomenal movement that is sure to captivate anyone who listens attentively: You feel like crawling up in between the notes and staying there – it’s that special. “It has been said, and quite rightly so, that Schmitt’s Second Symphony is a work of youth. Certainly, upon study of the score it soon becomes obvious that Schmitt has not lost his capabilities of inventiveness or his powers of orchestration. The complicated rhythms, almost a trademark of the composer, are still there and the mood is as rich and vibrant as ever. As always with Schmitt, it soon becomes apparent that one is listening to the work of a master who was able to conceive patterns within patterns and to visualize an ultimate coherence within the completed fabric. In addition to premiering the piece in Europe, conductor Charles Munch also presented the first North American performance of Florent Schmitt’s Symphony No. 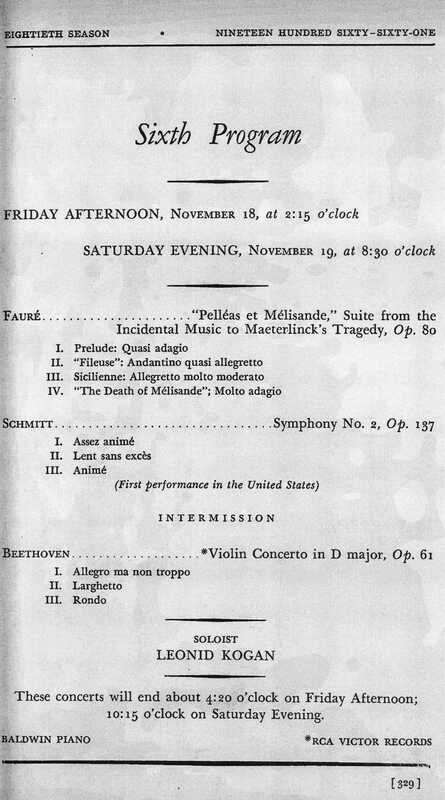 2 (with the Boston Symphony Orchestra on November 18, 1960). “This was the first time Schmitt attempted to create a “classic” symphony — one with three movements shaped in the traditional way — and without any featured instrument or extra-musical argument or title. The Symphony No. 2 has had little exposure in the concert hall or in recordings since its debut over 50 years ago. 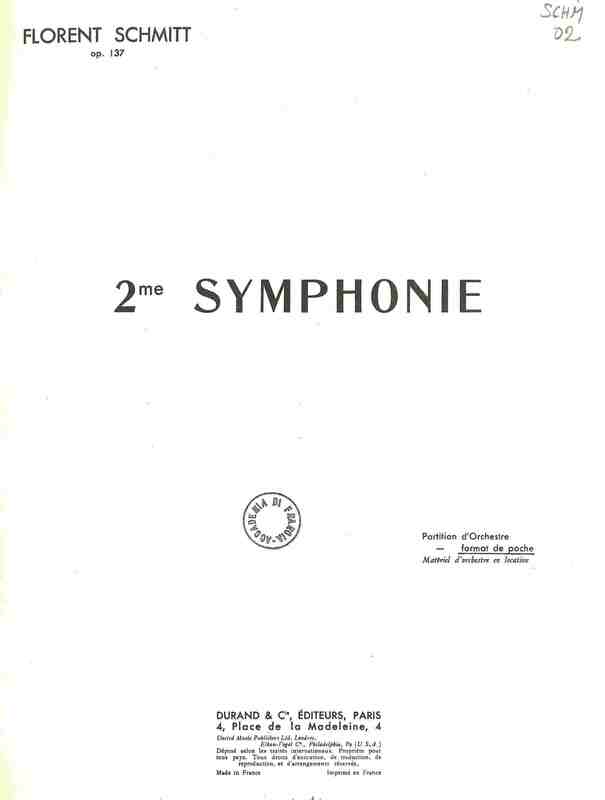 Soon after the Strasbourg premiere, the conductor André Cluytens presented it with the Paris Conservatoire Orchestra on November 2, 1958. Jean Martinon also presented the music with the ORTF in 1960 (see below), while Charles Munch introduced the symphony to American audiences in a Boston Symphony performance in November of 1960. But after this initial flurry of activity the symphony pretty much disappeared from sight. 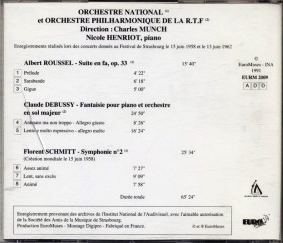 As for recorded documentation of this symphony, the Charles Munch premiere performance from 1958 was issued on CD back in the early 1990s in a French release (Euromuses EURM 2009) that is difficult to find today – even in France. But fortunately for us, this stunning performance has now been uploaded to YouTube in its entirety (although the sound quality of the YouTube dub is inferior to the CD). More recently, a far better transcription of the same Munch performance has been uploaded to the MQCD Musique-Classique website, and I strongly encourage listeners to access the performance there instead. In 1988, the Symphony was recorded by Leif Segerstam and the Rhineland-Pfalz Philharmonic and released by NAXOS on its Marco Polo label. The memorable second movement from that recording is available to hear on YouTube. I own both recordings of the symphony, and there are some interpretive differences between them. There’s no question that the Munch performance is thrilling — with the difficult score well-prepared by the conductor and orchestra and the final movement realized in a fresher, more lithe manner when compared to the Segerstam reading. … Which is not to say that the Marco Polo rendition isn’t anything other than polished. Moreover, it’s also a superior recording from a sound-quality standpoint. I am unaware of any U.S. performances of the Symphony No. 2 that have been done since Charles Munch gave the North American premiere with the Boston Symphony Orchestra in 1960. The American conductor Leonard Slatkin has programmed the piece in recent years – but only in Europe. 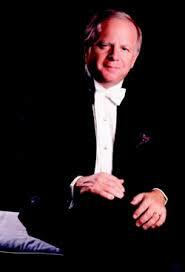 The American conductor Leonard Slatkin has programmed Florent Schmitt’s Symphony No. 2 in Europe — but not in the conductor’s native country. Interestingly, the Symphony has also been arranged for wind ensemble – and very successfully, too. The concert band version is available on a Japanese CD in a performance featuring the Akita-Minami Senior High School Wind Ensemble conducted by Tomohiro Abe. The Symphony No. 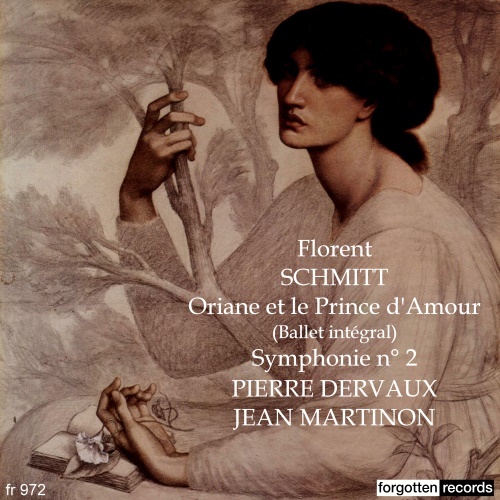 2 would turn out to be the last major work that Florent Schmitt composed. He passed away six weeks following the premiere of the symphony, just one month shy of his 88th birthday. Florent Schmitt and Felix Aprahamian at the world premiere performance of Schmitt’s Symphony No. 2 in Strasbourg, France in June 1958. Also pictured are composer-critic Gustave Samazeuilh, pianist Frank Mannheimer and musicologist Marc Pincherle. With Schmitt’s death, the last of the distinctive generation of French composers born in the 1860s and 1870s – Charpentier, Cras, Debussy, Dukas, Koechlin, Magnard, Pierné, Rabaud, Ravel, Ropartz, Roussel, Tournemire and others – passed from the scene. Jean Martinon’s 1960 performance of Florent Schmitt’s Symphony No. 2 has been issued on the Forgotten Records label (June 2014). 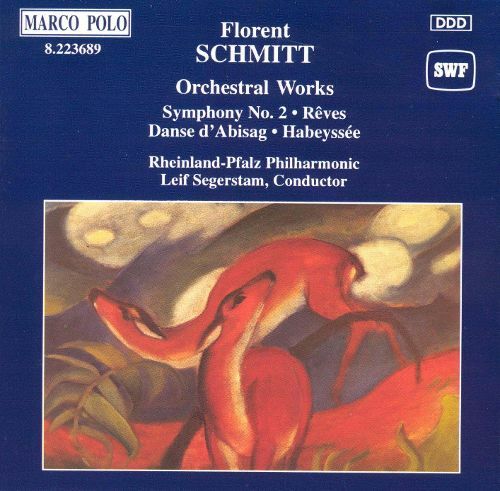 Update (6/25/14): A third recording of Florent Schmitt’s Symphony No. 2 has now been released. It is a 1960 concert performance with the O.R.T.F. Orchestra directed by Jean Martinon — a conductor who was an evangelist for Schmitt’s music throughout his career. The CD is available from Forgotten Records. While the sonics are rather typical of the constricted broadcast audio of the day (and monaural rather stereophonic), Maestro Martinon more than makes up for that in terms of visceral excitement. It’s a must-hear performance. 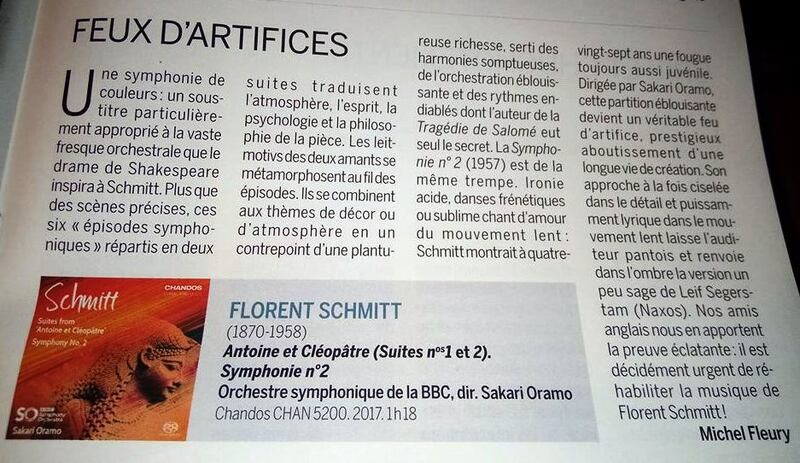 Update (3/6/18): Chandos Records has issued the fourth recording of Florent Schmitt’s Symphony No. 2 (actually, it’s only the second commercially recorded rendition). Featuring the BBC Symphony Orchestra conducted by Sakari Oramo, it is a stunning recording — both in terms of the interpretation as well as the full-bodied sound, which is of audiophile quality. The latest recording of Florent Schmitt’s Symphony No. 2 is on the Chandos label (March 2018). Due to its all-around stellar production values, there’s no question that this recording has become the new “go-to” rendition of Schmitt’s Symphony No. 2. The new Chandos recording of Florent Schmitt’s Symphony No. 2 was named one of the top recordings for 2018 by Classica, the French classical music magazine. This entry was posted in Classical Music, Composers, French Composers and tagged Charles Munch, Classica, Classical Music, David Eccott, Dutilleux, Florent Schmitt, French Composers, Jean Martinon, Leonard Slatkin, Marc Pincherle, Music, Nicolas Southon, Nones, ORTF Orchestra, Sakari Oramo, Schmitt, Strasbourg Festival. Bookmark the permalink. Thanks a lot for commenting on this very rare work! Schmitt’s role in French musical history is a bit special, as his musical idiom is not linked to Debussy or Ravel who are still considered as the main proponents of Twentieth Century French classical music. Although his orchestral skills are indisputably on a par with his two famous fellow citizens, his sensuous themes, lush harmonies and passionate melodic lines easily demonstrate that his work should be revisited and thoroughly explored. Magnificent composer. Symphony No. 2 is a masterpiece. That it is, Mr. Hess. I know of at least three conductors who would dearly love to perform it. But the music is technically and rhythmically very challenging, and so a virtuoso orchestra is needed to do it justice.